Brand loyalty tends to rule the high-performance powerboating world—that’s a fair and reasonable axiom. For a prime example, look no further than the case of longtime performance-boat owner Gary Seeds. In advance of his 60th birthday—happening this Sunday if you care to send a card—Seeds, who lives with his wife, Traci, in Cincinnati, Ohio, ordered a Cigarette Racing Team 42X sportboat powered by dual-calibration Mercury Racing 1350/1100 engines through Performance Boat Center last fall. His former ride, a 2015 model-year 42X powered by Mercury Racing 1100 currently is for sale—he traded it in as part of the deal—by the full-service, multi-brand Osage Beach, Mo., powerboat dealership. Prior to his first 42-footer, Seeds owned another Cigarette—a 2011-built 39 Top Gun Unlimited powered by Mercury Racing 700 SCi engines. 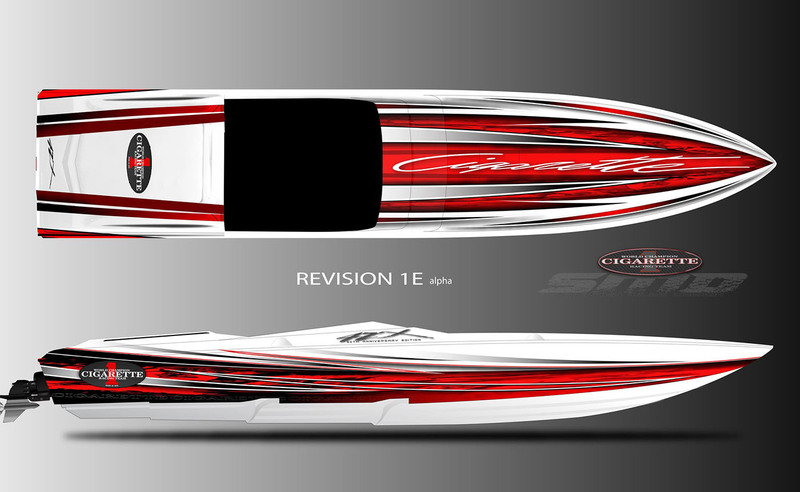 David Hunter will apply Stephen Miles-designed graphics to Seeds’ new 42-footer. Prior to his love affair with Cigarette, Seeds had a burning passion for Nordic powerboats. He became familiar with the brand shortly after he went to work for the Hillman Group in 1983—the same year he and Traci married—and was transferred to Southern California to manage the company’s West Coast sales territory. By the time he headed back to his native Ohio 10 years later, he’d logged plenty of time on Lake Havasu in Arizona and was a devoted Nordic customer. Before purchasing his first Cigarette, he had owned a 1992 Nordic Venture, a 1995 Nordic Heat, a 2000 Nordic Flame, a 2004 Nordic Flame and 2007 Nordic Flame. That was quite a progression for a guy who’s first boat was 1987 Sea-Ray Pachanga. Though Seeds loves the Nordic line-up and always will, moving into bigger water for poker runs on rougher waterways eventually forced his hand, so to speak, and pushed him into bigger boats better suited for the job. But with three children and six grandchildren, family boating remains his top priority regardless of the type boat he owns. There is one exception. As he did with his last two new Cigarettes, Seeds and his friends Corey Duke, Scott Deaton, Bill Blaxton and Phil Sousa will take his new 42-footer on a four-day, maiden voyage “boys trip” in the Florida Keys in May after it is delivered to Grove Harbour Marina in Coconut Grove. Following that adventure, the 42X will be delivered to Jamestown Marina near the Seeds’ second home on the shores of Lake Cumberland in Kentucky. From there, he said, it’s an easy haul to poker runs throughout the Midwest, which he’ll hit hard this summer. Still for sale at Performance Boat Center, Seeds’ previous Cigarette was a 2015 model-year 42X. Seeds is particularly pleased that he ordered the boat with the dual-calibration Mercury Racing engines. “With the 1350/1100 engines we can basically go anywhere and not have to worry about finding the right fuel,” he said. At present, the hull and the deck of the 42-footer are married together. Once the boat reaches the graphics-application stage, painter David Hunter will apply color scheme designed Stephen Miles of Stephen Miles Design in Owensboro, Ky. Seeds emphasized that while he ordered the boat through Performance Boat Center he’s been working closely with Cigarette Racing Team’s Bud Lorow throughout the process. He plans to visit Cigarette headquarters in Opa-Locka, Fla., to check out the build during the Miami International Boat Show next month. Come May, Seeds will take delivery of the new 42-footer and head for the Keys with his friends. And once 42X arrives in Kentucky—Lake Cumberland is just a few hours from his Cincinnati—he can really begin his boating season. And for next three years at least—just as he has since 2011—he’ll enjoy the Cigarette difference. What’s Next For Key West?